An shoot'em-up arcade game by Capcom. The Japanese title is Senjou no Ookami (戦場の狼) – Wolf of the Battlefield. If was the first arcade release to use an FM sound chip. The player controls a lone soldier on a top-view battlefield, and the goal of the game is to advance upwards on the scrolling screen, defeating enemies that come in from the top and the sides. The player can hide behind rocks and trees that stop bullets, and can also throw hand grenades that will reach behind boulders. 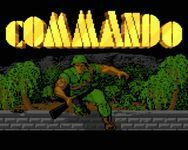 Commando was sequelled by the arcade game "Senjou no Ookami II", called "Mercs" in the west, a game that allowed for 3 players simultaneous play. The game was ported to many of the 8-bit consoles, and became a cult classic. It influenced many of the subsequent action games. The music for the Commodore 64 port, a popped-up version of the arcade tune, was made by Rob Hubbard, and is now regarded as one of the most famous C64 music strips. Rob Hubbard himself states that it was created in less than 12 hours, during one night(1). The Amiga port had music by Mark Cooksey (1). Source: Wikipedia, "Commando_(game)" and "戦場の狼", available under the CC-BY-SA License.